A Chiffon Cake is a type of Foam Cake and it belongs in the same category as Sponge Cakes and Angel Food Cakes. It's a little different than other foam cakes as it contains baking powder, uses both egg yolks and egg whites, and contains a liquid fat. 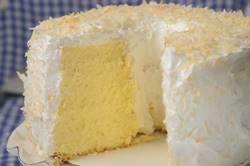 This produces a moist and tender cake that is wonderfully light and spongy. It is excellent plain, but for this recipe we are covering it with a delicious billowy sweet Marshmallow Frosting and toasted coconut. It is sure to become a favorite. This Golden Chiffon Cake is the same recipe that I used to make the Strawberry Chiffon Shortcake. Only instead of baking two round cakes, for this recipe we are using one large tube pan. The pan is not buttered which allows the batter to cling to the sides of the pan as it bakes. The tube in the center of the pan lets the hot air circulate so the heat can reach the center of the cake. The cake needs to be turned upside down immediately upon removing it from the oven as this keeps the cake from shrinking and losing its volume. This cake is excellent without a frosting, and can be served with whipped cream and fresh fruit or a fruit sauce. However, I couldn't resist covering it with a Marshmallow Frosting (also called a Swiss Meringue). This is basically a meringue, a whipped mixture of egg whites and sugar, only it doesn't need to be baked. That is because we first heat the egg whites and sugar over a saucepan of simmering water which dissolves the sugar and heats the egg whites to 160 degrees F (71 degrees C) which is the temperature needed to kill salmonella. So you will need a candy thermometer. Once that is done the egg whites and sugar are simply taken off the heat and whipped to stiff peaks. While you could use a butane torch to brown the meringue once you have frosted the chiffon cake, for this recipe we are sprinkling the meringue with toasted coconut. Golden Chiffon Cake: Preheat your oven to 325 degrees F (165 degrees C) and you will need a 10 inch (25 cm) two piece ungreased tube pan. In the bowl of your electric stand mixer, fitted with the paddle attachment, (or with a hand mixer) place the flour, 1 cup (200 grams) sugar (Sugar 1), baking powder, and salt. Beat until combined. Make a well in the center of the flour mixture and add the egg yolks, oil, water, and vanilla extract. Beat on medium speed until smooth (about one minute). Scrape down the sides and bottom of the bowl as needed. In another clean bowl of your electric stand mixer, fitted with the whisk attachment (or with a hand mixer), beat the egg whites, on medium low speed, until foamy. Add the cream of tartar and continue to beat until soft peaks form. Increase your mixer speed to high and gradually beat in the remaining 1/2 cup (100 grams) of sugar (Sugar 2) and continue to beat until stiff peaks form. With a large rubber spatula or wire whisk, gently fold the egg whites (in three additions) into the egg yolk batter just until blended (being careful not to deflate the batter). The unfrosted cake can be stored in an airtight container for a few days at room temperature or for about five days in the refrigerator. This cake can also be frozen for a couple of months. Marshmallow Frosting: In a heatproof bowl (preferably stainless steel) whisk the egg whites with the sugar and cream of tartar. Place over a saucepan of simmering water and, whisking or stirring constantly, heat the egg whites until the sugar has melted and the mixture is hot (160 degrees F or 71 degrees C) as this is the temperature that kills the risk of salmonella. Remove from heat and transfer the egg whites to your mixing bowl fitted with the whisk attachment (can use a hand mixer). Beat the whites on high speed until stiff peaks form. Beat in the vanilla extract. Place the Golden Chiffon Cake on a serving platter and frost the top and sides of the cake with the Marshmallow Frosting. Sprinkle with the toasted coconut. Coconut: Spread the coconut on a baking sheet. Bake in a preheated 325 degree F (165 degree C) oven for about 10 - 15 minutes or until the coconut has turned a beautiful golden brown color. As the coconut bakes, stir it occasionally so it browns evenly. Remove from oven, place the baking sheet on a wire rack, and let cool.